Imagine a strange, tropical place that is almost inaccessible. Time appears to have stood still there. Species of animal and plant life not seen elsewhere on Earth, except in the fossil record, inhabit the place. The lakes heave with the shapes of huge grey bulks moving under the surface. The woods are places where chittering cries move about above your head, as powerful apes move swiftly in the canopy of leaves. Then, a tree splinters nearby, and a dinosaur steps out from his hiding place… and he’s eying YOU. Jurassic Park? Not quite. 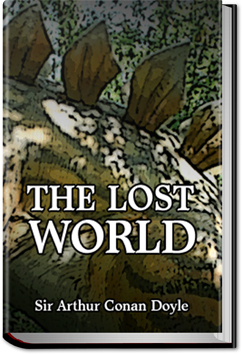 The Lost World was an inspiration for Jurassic Park; in fact, a character in J.P. has the same name as one of the chief characters in The Lost World. It also inspired King Kong. But this is the original! Four adventurers go off to find the place shown in a dead man’s sketch book – they find a war between apes and Indians, prowling dinosaurs, a sparkly treasure hidden in the blue clay – they find the Lost World. And because of the treachery of a native guide, their means of escape is destroyed! This entry was posted in Action/Adventure Books and tagged allyoucanbooks.com, audio books free, ebooks free, free audiobook, free kindle books, unlimited action and adventure books, unlimited audio books on October 29, 2014 by allyoucanbooks.